Notre Dame U. plans to bestow an honorary degree on President Barack Obama. This caused the ultra Iraq War Hawk, Rep. Peter T. King (R-3-NY), to toss a major hissy fit. He insisted that because of Obama’s support for abortion, that the award would be an insult to “Catholic moral teachings.” Why weren’t these Catholic standards applied to the Bush-Cheney Gang’s War without End, torture policies and the shredding of the U.S. Constitution? He was just in time for April Fools’ Day, 2009! 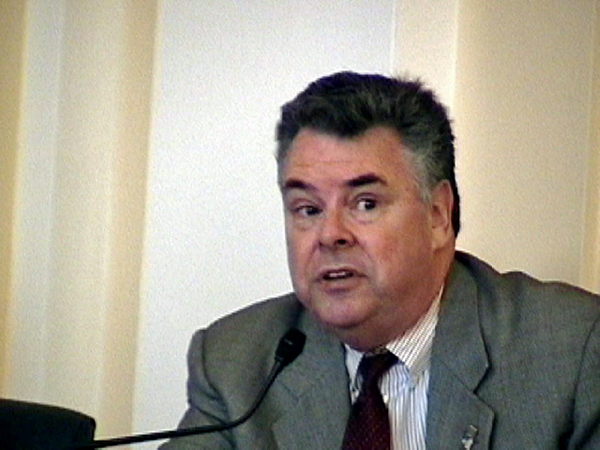 His name is Peter T. King and he’s a Republican member of the U.S. House of Representatives from Long Island, NY. And, for the last eight years, he was one of the prime enablers of the worst excesses of the Bush-Cheney Gang in the Congress. Now, with the financial meltdown ongoing, Rep. King has jumped onto the national stage to add unintended comic relief for the millions in shock over their fast-vanishing 401(k)s. He solemnly pronounced that the idea of Notre Dame U. granting President Barack Obama an honorary degree was a “tacit acceptance of the president’s abortion views.” Then, Rep. King, a la Thomas Aquinas, added that it would also be “antithetical to ‘Catholic moral teaching’ on the sanctity and value of human life.” (1) Thank you “Father,” I mean, Rep. King. Back to the windbag Rep. King. He once bragged: “I thank God every night that George Bush is our president.” (2) I wonder what the Congressman’s blue collar constituents think of him now that Dubya’s reign of ineptness has many of them out on the street looking for a job? (4) Another one of Rep. King’s heroes is the late President Ronald Reagan, who gave America the disease of “Reaganism.” His dreadful economic ideology is mostly responsible for setting the current financial meltdown in motion. It embraced “deregulation” of the Market as gospel. He set loose the Vulture Banksters on the people. I’m convinced that Reagan was a pious faker and that he was never a true friend of the working man and women. His role in unjustly firing the 11,000 striking PATCO workers, in 1981, proved that to me. (5) As for Rep. King, the apple doesn’t fall far from the tree! Rep. King’s big mouth has also gotten him into trouble on other matters. He once said: “There are too many mosques in this country.” (2) He also stated on another occasion: “85 percent of the mosques in this country have extremist leadership.” (2) Now, can you image how Rep. King’s Irish immigrant grandparents would have felt, after they had landed in NYC fleeing the “Great Famine” in Ireland, (1845-50), if a member of U.S. Congress would have roared: “There are too many Catholic Churches in this country. And, the majority of the Catholic Churches are breeding grounds for terrorism!” Rep. King has chosen to forget his own history! Queries for Rep. King to consider, via a vis his putative “pro-life” persona: What about the 4,263 brave American troops who have died in Iraq for lies? What about the lives of those 1.3 million Iraqis who have been killed in this totally unnecessary and unjustified, preemptive war, which was launched by the Bush-Cheney Gang on March 20, 2003? What, too, about the 4.7 million Iraqi refugees who were created as result of the Iraq conflict. As for the cost, try $3.5 trillion to U.S. taxpayers and rising. (8) Isn’t what happened to the sovereign nation of Iraq because of the Bush-Cheney Gang’s lust for war a damnable sin, Rep. King? Finally, H.G. Wells said: “Moral indignation is jealousy with a halo.” Notre Dame U. is right to give President Obama, who voted against the war in Iraq, an honorary degree. He makes a much better choice than Rep. King, who I suspect is a little green with envy about the selection. And, it is long past the time for reactionary Roman Catholic politicos, like the ultra-hawkish, pro-fetus, pro-Death Penalty Rep. King, to stop acting (and preaching) like they live in the Middle Ages. Our Republic can’t afford it. ©2009, William Hughes, All Rights Reserved. William Hughes’ videos can be found at: http://www.youtube.com/profile?user=liamh2. His latest book, “Saying ‘No’ to the War Party,” is available on Amazon. Email Contact: liamhughes@comcast.net.